Too often, general contractors are hired based on their ability to sell a dream – yet their home additions and home remodeling projects tend to fall short in many respects. The goal for homeowners when searching for a home, kitchen, or bathroom remodeling professional, is to improve the aesthetics of their home. As a former U.S. military construction engineer with six years of service, home improvement contractor Richard Dean prides himself on his attention to detail and work ethic, and offers the assurance that he isn't selling a dream, but a vision of a soon-to-be reality. At Dean's Construction, we focus on finding the right home improvement project for you. We study your home and find the areas that need improvement the most, then let you know how much the remodeling project will cost – as well as how much it will add to your home's resale value. More importantly, the home improvement contractors at Dean's Construction focus on making sure that whatever type of work they do will last. Beautiful architecture will crumble when not completed with care. That is why we treat every home remodel and home addition the same way we handle our door installations and window installations: with care. For a free estimate on your home remodel in Elmira, NY, call Dean's today! Bathroom Remodeling: If you cringe when guests ask to use your restroom, you may need our help. We have executed countless bathroom remodeling jobs in Elmira, NY, and surrounding areas. Whether you want to be completely involved in the bathroom remodeling process or prefer to leave the choices to our expert home improvement contractors, Dean's Construction will make sure your bathroom remodeling project is not only beautiful but also functional, with complete electrical wiring done in-house, as well as all plumbing services handled by us. Kitchen Remodeling: Spending time in your kitchen won't seem like such a chore when you have brand new appliances, new granite counter tops, custom cabinets, soft-close doors, and a center island with room to manage those large guest parties you've been wanting to host. If you enjoy cooking, but only when it's at your neighbor's, give Dean's Construction a call for a free estimate. Home Additions: Our home improvement contractors handle everything regarding your home addition from start to finish. Avoid having to hire one company for your grading / demolition, another for your framing, yet another for the build, and two more for the plumbing services and electrical wiring. If you are in need of an in-law suite, a new nursery, a sunroom / screened in porch, or simply want to finish out your basement, Dean's Construction can help. Call for your free estimate today! 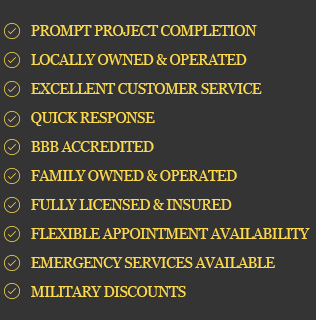 We believe in our work, our pricing, and our quality of service, so if you receive a written quote from another Elmira, NY, contractor, we'll match it. Copyright © 2019 Dean's Construction, all rights reserved.